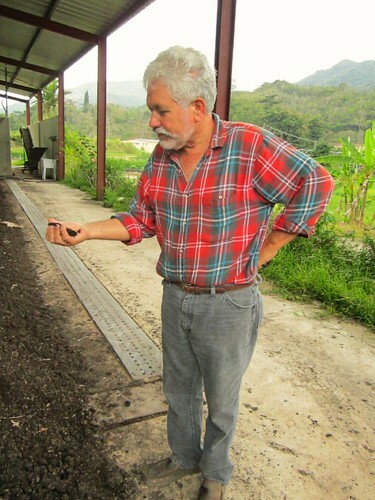 José Pons, a coffee farmer in Castañer, Puerto Rico, patted the palm of his hand on the old and rusted equipment that his grandfather had once used to process coffee beans. He explained matter-of-factly how the machinery, with its large funnel and series of metal chutes, had once been used to shake coffee beans from their shells. Later, Pons led our research group to the barn next door where we watched his modern coffee processing equipment at work, shifting coffee beans through a small automated assembly line. A view of the mountains surrounding Castañer, Puerto Rico. 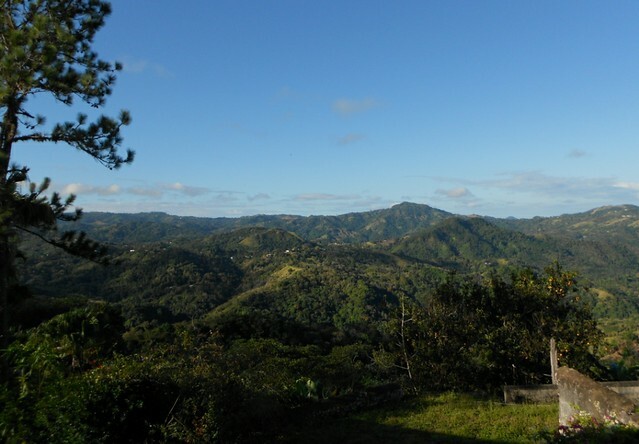 This photo was taken from coffee farmer Pedro Bengochea’s lodge. Photo credit: Sara Hess. Pons was one of several farmers I met last January while traveling in Puerto Rico with a team of researchers from the Community Innovators Lab (CoLab). Pathstone, a non-profit community development organization specialized in aiding agricultural workers, had invited us to the island. With support from the U.S. Department of Agriculture’s Rural Innovation Fund, Pathstone asked us to assist in devising a tourism-focused economic development strategy for Castañer, Puerto Rico. Castañer, a rural inland region that suffers from the highest incidence of poverty on the island, is also home to Puerto Rico’s agricultural heritage. While the island was a hub of agricultural activity from the 1830s through the 1950s, producing sugar cane and coffee in abundance, industrialization policies implemented in the 1950s led to a severe decline in agriculture. Now, there are few farmers left tilling Castañer’s fertile soils. Out migration, a resulting shortage of skilled/willing workers, and unpredictable climatic conditions make it difficult for Castañer’s remaining farmers to make a living. In light of these challenges, many of them are interested in developing coffee tourism in the region as a way to generate a more stable source of income. Several farmers, like Pons, already offer ad-hoc tourism experiences. But tourism infrastructure is limited in Castañer, and most tourists learn about the farms by word of mouth. Overall, visitors to Castañer coffee farms are still few and far between. Pedro Bengochea is a coffee farmer in Puerto Rico. He is interested in starting a tourism business. Photo credit: Alyssa Bryson. One of my main responsibilities as a research assistant for the project was to perform a global scan – look at rural and agricultural tourism initiatives worldwide and consider what lessons others’ experiences may have to offer Castañer’s tourism entrepreneurs in their attempt to professionalize and attract more visitors. In my effort to determine what rural tourism practices worked elsewhere and could potentially work in Castañer I was faced with the challenge of identifying “success” stories. I initially approached this task with a rather narrow mindset – the stated objective of Pathstone’s work in Castañer was to create a more stable source of income for local farmers. So, I focused on searching for rural tourism projects that had accomplished a similar, profit-oriented objective elsewhere. Unfortunately, few of the global cases I found offered solid data on financial returns and those that did reported meager earnings. For example, I was interested in using the Grenada Chocolate Company, a cooperative chocolate company and tourism operator in the Caribbean, as an example to demonstrate how a rural tourism entrepreneur can succeed with limited resources. The company appeared to have made incredible progress in regards to preserving traditional agriculture, producing award winning chocolate, and sharing its knowledge with tourists; but it had only begun to earn a modest profit after 10 years of operation. I wondered – would Castañer’s farmers deem such a story a success? Or would they see it as a long, hard struggle that generated only modest returns? I tried to re-consider what success would mean for Castañer’s coffee growers and tourism entrepreneurs. Would it mean achieving the goal specified at the outset – a more stable source of income? Or is success for an economic development initiative such as that proposed by Pathstone for Castañer more multidimensional than a P & L statement? Remembering back to José Pons and his farm, it occurred to me that while Pons needs enough income from coffee sales and tourism for his business to remain viable, success in his case will entail more than just financial returns. Pons saved his grandfather’s old farming equipment not just because he thought it would draw tourists, but also because he wanted to preserve a piece of the past. Everyday when he begins work on the farm he is taking part in a hard fought battle to preserve Puerto Rico’s agricultural heritage and to share it with the world. An increase in income alone will be unsatisfactory if Pons and other community members like him fail to preserve the aspects of their rural heritage that they value – the very characteristics that keep them in the farming business to begin with. With this knowledge in mind, I expanded my definition of “success” to share with Pathstone the story of rural tourism initiatives that did more than generate profits. I documented lessons from any rural tourism project that had managed to preserve and honor the history of a region by sharing it with others. I shared the stories of rural tourism initiatives that had brought together members of a community in a common goal and/or succeeded in procuring local public amenities. For example, I documented a tourism initiative started by residents of Treasure Beach, Jamaica. There small business owners and other residents demonstrated the power of working together by creating a website advertising area attractions and a community fund which uses tourism revenues to invest in community needs, like purchasing a new ambulance. I also shared the story of coffee tourism in Nicaragua where the government has helped support the development of a coffee tourism route (Ruta del Café) by making micro loans available to entrepreneurs. The final insights and recommendations I provided to Pathstone and, in turn, Castañer’s farmers, are not likely to lead to quick profits. But for Castañer’s remaining farmers, if success were defined as an impatient push for profits they would have abandoned their fields long ago.